What happens when two of retail’s most whimsical women join forces? 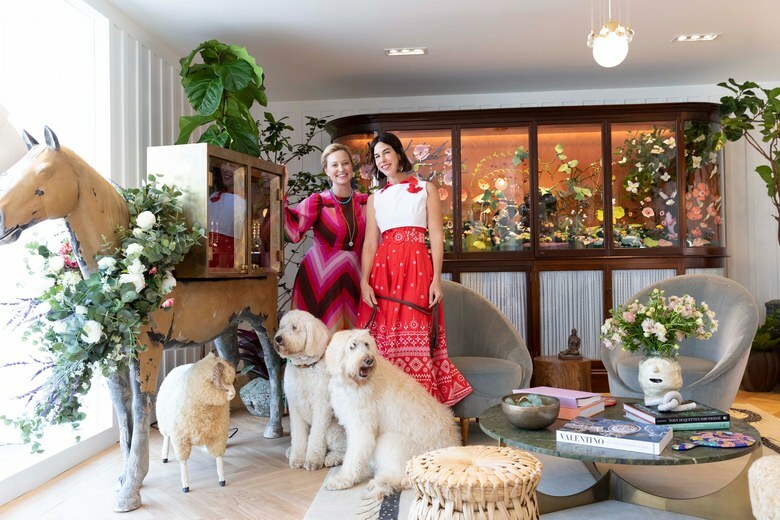 Inside Capitol’s exquisite new outpost at Brentwood Country Mart in Los Angeles, boutique owner Laura Vinroot Poole and jewelry designer Irene Neuwirth’s shared love of color and unabashed playfulness is given free reign. From the vintage model horse named Wonderful Eric at the shop entrance (Neuwirth is a keen rider) to the woodland-themed installation by artist Clare Crespo, complete with pink opal strawberry earrings hanging from felt vines and tourmaline and diamond rings sitting atop toadstools, to the giant paneled de Gournay folding screen and the wall of Cinderella-worthy evening gowns, the space presents a Pandora’s box of delights designed to you draw in and keep you there. “In Charlotte, customers come in and stay all day,” says Poole. The joint endeavor has been a long time in the making as the pair first met 17 years ago, when Neuwirth was doing a trunk show in Charlotte across the street from Poole’s 20-year-old sartorial Mecca. “I walked in and was just wowed,” she recalls. “I ended up moving my jewelry into Capitol the following year, and since then Laura and I have worked together, traveled together, and become the closest of friends.” Says Poole, “Our businesses have really grown in tandem.” So when the opportunity to go into business together presented itself, they only needed the slightest of nudges. “I grew up coming here every Sunday,” says Neuwirth of the iconic Westside location, where on any given day you might see Alessandra Ambrosio grabbing a coffee, Angela Lansbury browsing in the bookstore, Gwyneth Paltrow popping into her nearby Goop store, or Harrison Ford eating a taco in the food court. “My dad and I would ride our bikes down and get a fried chicken basket from Reddi Chick.” Poole, on the other hand, has long had a loyal clientele in Los Angeles who have looked to her for introductions to brands such as Horror Vacui, Erdem, Sies Marjan, Peter Pilotto, and The Vampire’s Wife. “Sometimes the stars align and an opportunity presents itself that you just can’t refuse. The Brentwood Country Mart is always the first place I go after I land in L.A.,” she says. When Beyoncé headlines a festival, you know things will be next level. After stints at Glastonbury, Made in America, and that unforgettable “Beychella” moment back in April, the queen of pop is used to raising the fashion bar for performances. Case in point: Yesterday at the Global Citizen Festival, she and her husband Jay-Z brought their act to Johannesburg with fanfare and a slew of custom designer looks chosen by Beyoncé’s team of Zerina Ackers and Jenke Ahmed Tailly, plus Jay-Z’s longtime stylist June Ambrose. Each outfit had its own flavor. 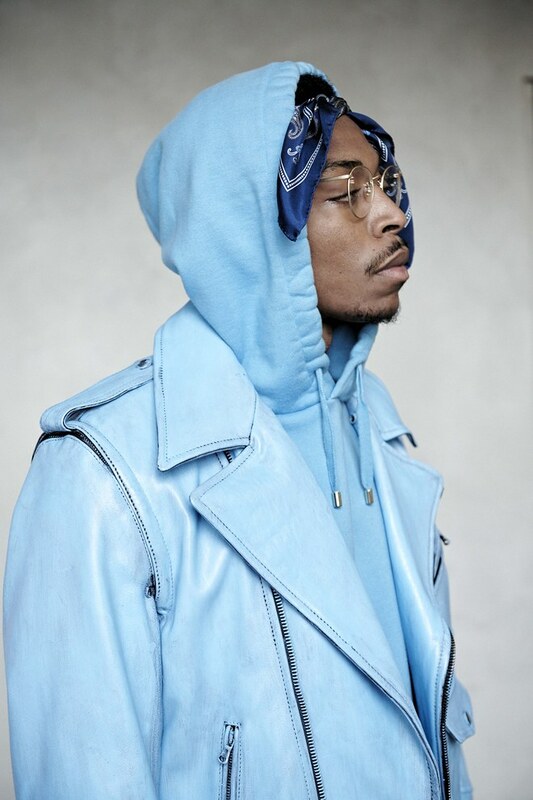 Jay-Z stuck to royal purple suits by Calvin Klein and a series of casual pieces like a Sacai’s sleek Truth hoodie, while Beyoncé provided the night’s show-stoppers in several pieces that paid homage to the festival’s location and the Carter’s affinity for Afrocentric art. The sculptural shape of the Balmain top she wore to perform “Ape$hit” echoed the silhouettes Olivier Rousteing has been featuring within his collections of late, but the addition of a plume of feathers and Egyptian hieroglyphs brought a new verve. Likewise, Mary Katrantzou’s puff sleeve cape paired with a sequin-encrusted body suit stayed true to the designer’s boldly ornate ethos, but a map print of Africa’s 54 countries added another level of visual interest. As with the On the Run II tour, each segment of the performance came with its own style statement connected to the songs. To perform a special rendition of “Halo” with a local choir and her soulful duet with Ed Sheeran, the star wore a voluminous Ashi Studio gown with cascades of fuchsia tulle ruffles, while “Crazy in Love” called for an intricately beaded Esteban Cortazar mini dress accented by jewelry in the style of traditional Ndebele neck rings. 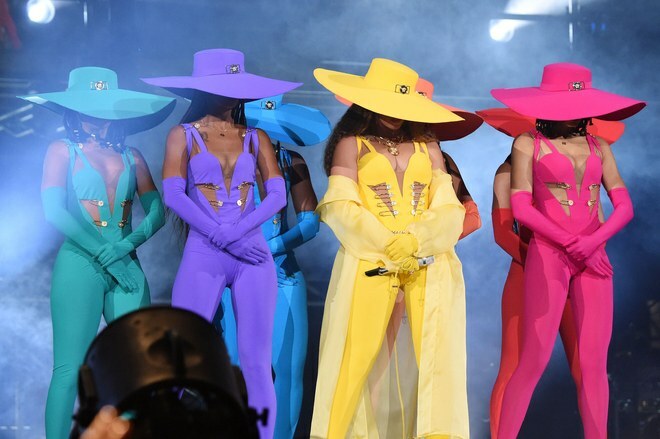 The neon yellow Versace catsuit—topped off with an outsize hat—complemented the anthemic "Run the World (Girls),” and an emerald Quiteria & George cape dress with a bodice covered in hundreds of crystals was a fittingly dramatic finale. Several of the outfits were assembled on site, and bringing the concert’s wardrobe to life was a labor of love. The effort put into this special project may have something to do with the message behind Global Citizen. More than a mere music festival, this year’s event commemorates 100 years since the birth of Nelson Mandela and celebrates his lifetime of political and philanthropic work. In an open letter posted on her personal site and in the South African newspaper Sowetan, Beyoncé outlined how Mandela’s influence has shaped her life. The star recalled their meeting in 2004 at the AIDS Benefit Concert in Cape Town and how Mandela’s humility and capacity for forgiveness continues to inspire her. 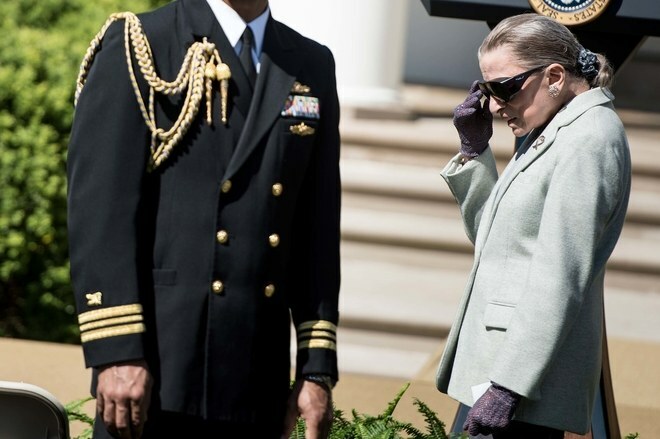 “You made it possible for so many people like me to reject impossibilities and understand our capabilities in making lasting change in the world,” she wrote, noting that her entire family holds the leader in high regard. Given the Carters’ respect for Mandela, it’s no wonder that they brought their A-game. Two-and-half years ago Umit Benan held a great Fall 2016 show in Paris—and then that was apparently it. The Swedish-raised, German-born, Turkish-lineaged designer of much-loved menswear dropped out of view. Later today, cautiously, he’ll be stepping back into it. From his new Milan home and studio he’s presenting a see-now buy-now collection called God is Black (pt. 1), and serving pasta. You can see a few of the collection images here, and they’re probably already up on the Umit Benan webstore. During his time out Benan underwent a course of therapy—“200 hours in total, up to 5 hours a day, intense!”—and said he rediscovered his belief in God. His reconnection with his Muslim identity sparked the journey that led to this collection. He added: “I was also inspired by Malcolm X and Martin Luther King and Tupac Shakur: African Americans who made a difference.” So perceptions of race and perception of religion—and how those perceptions become skewed into racism or religious intolerance by those doing the perceiving—are the two main notions Benan was exploring here. The result include takkes (or taqiyas) hand-knitted by Benan’s mother Hulya, as well as caftans, track suits, and Cuban shirts. His clothes remain beautiful, and as Benan said: “I’m always working to try and make conversations as I design.” It’s good to see him make a return to above-the-line fashion. Music festival season is fast approaching with Coachella kicking off this weekend and Bonnaroo to follow soon. And while you may have given thought to the perfect breezy crop top or eye-popping tangerine aviators, it’s high time to strategize on a desert-friendly hairstyle—one that can go toe to toe with the California heat and humidity. This spring, consider the braid—and not just any pair of plaits but a far more creative twist, pulled from the Vogue archives. See a sun-drenched Sasha Pivovarova with two shimmering fishtails hanging over her shoulders, or Taylor Hill sporting a triple French braid, the back wound together with a pink bungee cord. FKA twigs, too, transformed the popular off-duty look by plumping the top of each twist into a cool-girl knot, while María Elena Marqués went full Heidi in the ’40s for legendary lensman Horst P. Horst, exuding geek-chic appeal ahead of her time. There’s Amanda Burden copping Elizabeth Taylor’s iconic wedding hair, a thick Rapunzel-like rope stuck with white teacup roses—a dreamy alternative to the flower crown. Elsewhere, Twiggy’s golden, knee-grazing mane plays with a romantic proposal—unfurl each braid at the bottom, letting the ends ripple. For a touch of ease, Kirsty Hume’s scattering of small tails, haphazardly dotted around the head, and German model Charlene Högger's loose ribbon-accented plait offer two simple yet chic ways to rock the braid at your next festival and beyond. Leave it to Jennifer Lopez to amp up the cozy cardigan. The singer stepped out for some shopping with boyfriend Alex Rodriguez today wearing Gucci's chunky cable knit cardigan with varsity-themed embroidery. The oversized style features the label's signature red and green webbing, as well as a playful "Guccy" logo, which is a play on the house name that creative director Alessandro Michele found inspiration from via tags on Instagram. So, no, that isn't a typo. To give the look a more casual feel, Lopez wore the statement sweater with ripped denim jeans, Timberland boots, a burgundy bag and oversized sunglasses. Large hoop earrings — a J.Lo signature — rounded out the outfit. While she and Rodriguez didn't match ensembles for their outing this time, the couple do have a history of coordinating clothes. Earlier this month, the duo stepped out in his-and-hers turtlenecks. Perhaps they were shopping for their next matching looks on this shopping field trip?